In a new radio documentary, ex-national security aide Richard Clarke suggests the CIA tried to recruit 9/11 hijackers—then covered it up. Former CIA director George Tenet denies it. August 11, 2011 “Daily Beast” – -With the 10th anniversary of the 9/11 attacks only a month away, former CIA Director George Tenet and two former top aides are fighting back hard against allegations that they engaged in a massive cover-up in 2000 and 2001 to hide intelligence from the White House and the FBI that might have prevented the attacks. The producers, John Duffy and Ray Nowosielski, had previously made a well-reviewed film documentary, “Press for Truth,” (www.911pressfortruth.com), on the struggle of a group of 9/11 victims’ families to force the government to investigate the attacks. Clarke, who led government-wide counterterrorism efforts from the White House during the Bush and Clinton administration, has said in the past that he was astonished to learn after 9/11 that the CIA had long known about the presence of Hazmi and Mihdhar inside the United States. He said that if he had known anything about Hazmi and Mihdhar even days before 9/11, he would have ordered an immediate manhunt to find them – and that it would have succeeded, possibly disrupting the 9/11 plot. This entry was posted in 911, Art, Books, Music & Film and tagged 911, cia, cia hijackers, daily beast, FF4 Films, John Duffy, Khalid al-Mihdhar, Nawaf al-Hazmi, Ray Nowosielski, Richard Clarke. Bookmark the permalink. The Department of Homeland Criminals tells us we must have new security measures because of terror incidents like the “underwear” bomber – but what they leave out is the fact that they were running the operation themselves. They put the guy on the plane, they took videos of him – just like 9/11 itself – when you have the apparatus in place to run the terror “drill”, its not a big stretch to see them flip it live and create a real terrorist incident. Webster Tarpley explains this idea quite well in “9/11 Synthetic Terror: Made in USA” as does Capt. Eric May of Ghost Troop. Crucial to this narrative is the patsy, the Oswald, the Muslim hijackers. When you control the media you make sure the myth gets repeated 85,000 times, then the brain-washed public believes it because they are basically monkeys masquerading as bipedal hominids with a smattering of discernment and critical logic thrown in – but just a wisp. 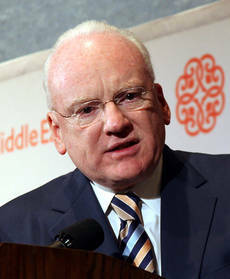 Former White House counter-terrorism czar Richard Clarke, gave his stamp of approval to the White House initiative. There might be one or two, make that hundred – other anomalous, stinking piles of bovine excrement we could explore regarding the false flag operation of 9/11 perpetrated by the powers that shouldn’t be. I do believe there are rogue elements within the USG and that at least one of them was involved in allowing the 911 attack. Who was actually on the plane I do not know — I’m still reading Susan’s book (very slowly). The two hijackers he names – both Muslim Arabs – may or may not have been on the plane. But, i will say I hesitated before posting this piece because it may just be more psyops — a little truth mixed with key deceptions. Maybe there were absolutely no hijackers on those planes – this would be substantiated by the lack of evidence such as video recordings, no passenger manifests or ticket sales records produced. Maybe there were no commercial planes involved, dummy planes with remote guidance. Maybe there were guys acting and dressing like terrorists who were part of one of those war games going on that day – like the drill where they were practicing a terrorist attack with a plane on a building. Funny how the media never mentions the dozens of war games – the smoke screen – is this real world or part of the drill? Gotta go with WW the Hybrid on this one, cuz the bs incompetent story still backs up the false myth that there actually were terrorists involved, so we need this ridiculous security state, and its ok to slaughter millions of brown people, and if we torture innocent children in front of their parents to make them confess to Al Qaeda terrorism, or the assassination of Lincoln, it’s perfectly good and noble because we are part of the Western Hemisphere, the hippest, most righteous Hemisphere on the whole damned planet – not like that other stinky Hemisphere, they think they’re so cool but they’re not. Fail. There were videos of the terrorists getting on each plane. The manifests showed the seats assigned to each one. Fail. Maybe GWB piloted the plane and jumped out at the last second. Do you see how ignorant you guys sound when trying to make up stories about what you “think” happened and then ignore the evidence that counters your claims? Since 2005, all this insider conspiracy was solidly established well beyond conjecture. Read “Infiltration” by Paul Sperry. (copyright 2005) It details how these hijackers were known, tracked, recruited, wooed, steered, supported, financed, housed, fed, and even ushered & shepherded until 9/11. No real surprises here. No need to debate. The real debate is whether to behead el busho’s so-called ‘judge’ cousin, or hang it by its neck -along with its unjust judicial cronies- while taking target practice by righteously exercising our Second Amendment to mete out true Justice. Personally, option 2 is preferrable followed by option 1 and parading around Cesspool, DC, with its head on a 10′ pike. That is because you can’t. You cannot corroborate a single claim. You need to make up funny stories to justify a earlier claim. Look at the ridiculous trail of thermite, thermate, nano thermate, etc when each one was proved wrong time after time. I’m sure all of you have read Clarke’s “Against All Enemies”; right, roggie? Albury, your MO is so transparent, I can see your wishbone sticking out of your emaciated frame. My MO is to become informed before offering opinions. Reading Richard Clarke’s book is part of that process. I scoff at Mr. Smith Goes to Washington. If you’re so informed, why are you such a dunce? You earn every Ad Hominem that slaps you upside your flat head. Are you 2 still in mourning over the misfortune that befell your hero in early May? Please feel free to post any denials of 9/11 by your hero after 2001. Your hero was given the same due process in May that he gave nearly 3000 innocent people on 9/11, roggie. Stercorem pro cerebro habes, roggie. Besa mi culo, roggie cabrón. Vouz avez plein de merde, roguemeister. Albury’s not the topic here, roggie. Richard Clarke wrote a book on what our intelligence agencies knew about your heroes prior to their 9/11 suicide attack on the US, and recently alleged that the CIA may have intended to “flip” two of them instead of arresting them. Discuss. I prefer the term “‘truth’ industry,” roggie. Have you donated recently, or bought some of Box Boy’s crap? You’d need probable cause, roggie, and there isn’t any. I’m sure all of those good people are quaking in their boots, roggie. If you’re really that worried about them, another layer of Reynolds Wrap might help. Did Richard Clarke make the “explosive new 9/11 charge” that the attacks weren’t planned and carried out by al Qaeda terrorists, roggie, or simply that the CIA may have secretly tried to flip two of your Allah-lovin’ heroes instead of arresting them? Where in “Rebuilding America’s Defenses” do the PNAC neocons advocate (instead of simply mention) a “new Pearl Harbor,” roggie? Hint: Pearl Harbor’s mentioned twice in the document. Although I’m sure you have piles of evidence and decades of experience in such organizations, I will have to call you out as a gullible fool being used by those that need 9/11 to be a CT so they can keep the “donations” coming in. Can you tell us all why a US agency would attack US troops? Politics? Money? Do you realize the money wasted by those you think that are benefiting because of the wars? I guess you cannot think it all out so you are forced to parrot claims made by others. How can you tell when CTists cannot refute claims made against their funny stories? They start to sound like 3rd graders. How many Architects and Engineers for Made Up Truth have ANY explosives training or expertise? ZERO! Why? Because when they tried to join to explain how the buildings showed no signs of explosives, Gage told them to leave. If a person is so intent on finding the truth, why would he exclude real experts? When shown real evidence, he resorts to running away from a real debate. Typical CT pattern. Make up a funny story, claim you have proof, get mad when asked for proof, call childish names, then pretend you wanted a real debate but can’t for some reason. Looks like Hybrid is shooting for the Sheep !st Class badge on this topic. CT Fail If it were “exposed”, the who exposed it? If you add up all the versions of this “exposed” story, you wold get so many answers, you couldn’t pin it on any single culprit. Why do you think there are so many splinter groups on 9/11 and not a single solidified one? Because everybody has a different story to tell. Keep in mind that the worse President in history was able to pull off a plot to kill 3000 US citizens and have himself called a hero. If this were truly exposed as you claim, he would have never been re-elected and certainly not living it up in TX. “As to the group you offered up – thanks it is a start list”??? You are waiting until now to get a list of perpetrators? I thought you had all the facts? Heck, I thought a Grand Jury was pending after 10 years of funny stories. Well? When are you going to go to a Grand Jury and put all or funny stories up for all to see? ho is chomping at what bit? We have a great legal system here. Use it. So, when does this New World Order take place? I have been hearing about for 3 decades an still nothing. Are you telling me that you still buy the funny stories about PNAC? I can easily assume you didn’t read the report since you quoted the “New Pearl Harbor” line out of context. This is common for those that do not wish to take the time to read ALL the facts and only limit themselves to CT websites and made up stories. Let me guess, you will use a CT web link? Oh God, my sides hurt too much!!! Your armored equipment was in ghillie suits? Let me guess, you think SWAT is military? Oh, you are too much!! Stop befiore I split a seam. If you want to make fun of the CT movement, you are doing a great job. Imagine warning the public about the armored vehicles coming down the street in “urban camo”. I told my friends and I actually had to show them. They didn’t believe me that ther are still people that make this stuff up. We all had a good laugh. I suggest you stop pretending to understand the military. you are just making a bigger fool of yourself than ever. Does ww = willie wonka? Because you have just as much credibility on the topics of military and 9/11. Most of the CTists have a little clue when it comes to 9/11 and the military. You on the other hand have none. You parrot canned talking points that have been debunked 5-8 years ago. It is as if you just joined the “movement” and are starting all over. Stick to funny stories about NWO and other thing that cannot be proven. All your canned points about 9/11 are easily proven false with 2 clicks of a mouse. Also, the guys here like to laugh at your poor attempts at sounding “informed”. You try, but with ZERO experience, you just soulnd like you are throwing a handful of darts at a board 30 feet away hoping some of them reach target, let alone stick. What is the crime? Attempting to arrest a war criminal is well in the dutites afforded them. I realize your VAST experience with UN/NATO R/E would tell us otherwise, but I would stick to those of us that know and not any of you that need to guess. This will be funny. Can you tell us all who/what did any “strafing of civilians” or anyone for that matter? I’m sure you can explain what it is and how it is done in military operations. Make to include the efectiveness of doing so. If I say NorthCom and ‘Boo’ in the same sentence, fo you jump like Alex “Little Bo Peep” Jones does? This is what happens when those with ZERO education try to pretend they do. Why is it that everytime you pretend to knoew sometihng, you can easily be proven to have ZERO clue? When and where did you serve your country? I can assume your response… It is well rehearsed, I’m sure. I see. Let me guess, you international law degree is still coming in the mail? did you send your prepaid envelope with $9.99 like it said? When will you begin the Grand Jury discovery motion? Just after your 9/11 one? Keep these coming, they’re great!! How does one gain this level of maturity and experience? I would have never thought of this and yet it came out so easily for you? Hmm…. So, when are you going to get help? So far your failed attempt at parroting debunked talking points tells us you have never really studied the topics covered here. I guess if you only have a choir to listen to you, you can say anything and be deemed a hero. Well, that is certanly not the case, is it? Like I posted earlier, we have real experts and you are hopelessly out-classed. Yes, I have worked with many SWAT teams in So CA with their explosives applications. They are hardly “militarized” other than advanced training and some better weapons, they follow the same R/E and laws of any police officer. What is your experience? Let me guess…. We don’t need to be “effectiove” since you cannot prove a single claim you present. It is your fairy tale. The burden of proof is all on you. Also, just seeing what you attempt to post is funny in and of itself. A quick question to get us back on topic. You have already posted your anti-Semitic bigotry, but we want to see it again. Who do you think was behind this so-called “inside job” and what was their plan? Why kill 3,000 US citizens? You pretend not to see the question, but to change the subject by pretending I must be a part of another group. You try and change the subject by paying the tired semantic game. By pretending to think you don’t understand the common use of anti-Semitic. Yes, being a anti-Semitic bigot comes with a lot of guilt, it seems. Pretend to think that by making up funny stories (or copy/pasting them from those that can think), you can divert the burden of proof onto those that are forced to prove a negative. Common fallacy. Parrot an old claim and pretend to think it matters as if it prevents you from answering the original questions. So, did you wish to answer the questions? Or are you wishing to dodge them again? They are not tough questions. The may be uncomfortable for the weak minded, though. Added dodges. These are common as it pretends that anybody that doesn’t drink the 9/11 CT Kool-Aid, must be a paid govt agent. Yes, those that cannot fathom that there are people out there that can actually think for ourselves, have extraordinary amounts of expertise, and can actually express our opinions and experience in a mature fashion. The best line to show that you have run out of canned talking points since you can only cut/paste a single article…This classic gem. Yes, pretending to walk away with your head held high having done nothing but parrot talking points and defending nothing. I wonder what would happen if I expose the poor attempts of your posts to other message boards for all to see. Yes, I will copy and paste them and give you 100% credit for every word you gave. After all, there are still people that think those that think the govt would kill their own citizens are not around due to the fact that they would be ashamed to face the public. I’ll give you a little help. You DO need help….Don’t you? Looks like the anti-Semite has chosen to ignore the questions and stick to the childish path. This is common when they are truly afraid to admit to the world that they are a bigot and wouldn’t want this to go out to the world in other message boards. Too late. Yes, when you cannot answer a single question without pasting it, you have nothing. Maybe you can hope go away and stop forcing you to answer questions that cannot be supported by your funny stories. After all, a person with such depth of knowledge on this topic should have no problem answering such easy questions. But, when outed as a bigot, she must run and hide. She is ashamed. Loose is to tight as lose is to win. Loose? Really? I guess you must be still waiting for that GED cert in the mail. Poor kid. The world is tough on fools that cannot defend themselves. Maybe it is in you city camo outfit you got online from the wanna-be military store with life-like patches and plastic rifle. Drink the Kool-Aid as original thought is not encouraged. Looks like I hit a little close to home. That is too bad. We all wanted to see him explain some of his pastes. I guess it is easier to run away and pretend you have won, then to actually stand up for your fairy tales and lose. If you no longer post here, I’ll do it for you. I have plenty of original thought to post. I’m sure your “choir” has seen all your pastes ad nauseum. Good to see you have no clue about finance as well. I wonder why cut/paste is all you have when trying to explain you utter lack of basic knowledge. I can see that you are on the bottom of life. Let me guess, the 30,000 new millionaires each year ruins your cliches of “class”. Since I am in the top 5%, does that make you a bottom dweller that I can control because am able to grow from the bottom 25% to the top 5%? I guess you are left to making up excuses for your lack of growth and blame it on the bankers (those that know how to handle money), the Jews (those that know how to handle money) and the rich (you know where this is going). Maybe you can tell us all you latest excuses why you are poor, can’t hold a job and need to pretend in fairy tales and evil bankers to feel better? “In writing this report, I will clearly demonstrate…”??? The problem is that you can’t clearly demonstrate anything since you are guessing, lying, and using old cliches that have no basis in everyday life. You repeat and/or cut/pate the same tired talking points that have been handed down by those that make the money from 9/11. what does that make you? An unpaid “automaton”. “These are the TVZombies that cannot see how 9/11 was the proximate cause.” Since you cannot explain how it has any way even possible, you are forced to live in a world of cliches and repeated claims of “Power Elite”. Since you are hidden from reality, you are easily fooled into thinking this even exists. So, how does it feel to be the bottom 1%? As a 1%er, you have nothing, can’t say anything, and will have the credibility of a roach limping along on 3 legs ready to be squashed by the so-called “Power Elite” knows as the rest of society. Grab your sandwich boards and proclaim that the US govt killed their own and you will be laughed at like the rest of your ilk. Not quite sure why you are stuck in neutral on this shill claim. If you have nothing to say, then admit you have nothing. It is like you are forced to ramble about the evils that made you stay with your parents while getting fired from fast food. It must be the Jews that prevents you from gaining that french fry job wasn’t it? You lash out with childish hate and cannot even explain why. Maybe the other guy will show up. Maybe he was tied of making you look foolish. Who knows/who cares. Maybe if you realize that The Matrix was a movie and those that pretend to make such fiction into their failed reality, then they can make believe that fake movies are the only bastion of reality they have left. Sad, as it is. A poor soul that must lash out and be chastised with her last hope at being taken seriously from a group of two on their board. “It has been ten years of this “debate” over 9/11.” And you still can’t convince a fraction of a minority of your claims. You can’t convince a single judge to hear your case. You can’t find a single lawyer willing to stake his or her reputation on a bunch of made up lies and guesses. Tell the judge that the 9/11 was a PSYOP and watch how long they laugh at you and throw you out of court. “It is known that…” Canned lie. You don’t know anything. You read a bunch of books and you pretend to know. You have ZERO education. You have ZERO experience. You have ZERO training. All you have is parroting the thoughts of those that make the money off your gullibility. Call names. It is all you have left. You can’t answer simple questions. You can;t explain your thoughts. You can’t explain how gravity works. You have no clue what an incendiary device is. You contradict yourself over and over. Yes, Do not debate with us “stooges”. We will wipe you around and clean the floor with your dirty-clothed bodies. You disgust the rest of us. The fact that you reside is such squalor tells me that you will never amount to much. Maybe I’ll toss yo a dime when you tell us that the Illuminati is talking to you in your head. Maybe we’ll feel sorry for you. Maybe we won;t and walk on by. Remember, shiny side up. It is the only way to survive. Roberts obviously hasn’t learned much, or he wouldn’t keep repeating his thoroughly debunked nonsense. Citing the fact that the 9/11 Commission Report didn’t mention WTC 7 is a straw man based on pure ignorance, assuming he even read the report. It wasn’t in its scope to list all of the damage, and the towers were only mentioned because they were (again) targeted by the 9/11 “truth movement’s” heroes. Claiming that Larry Silverstein publicly admitted to insurance fraud is another example of his ignorance and dishonesty. Typical David Ray Grifter wannabe. When did NIST “abandon its account of Building 7’s demise”? It wasn’t the first 2-1/2 seconds; it was 2.25 seconds starting at t=1.75 seconds, and the One-Trick Pony wasted the time of NIST and Dr. SUNDER with irrelevant crap. Collapse times have nothing to do with determining the cause of a collapse, and he simply created a straw man. Only a real novice would assume that a ~150,000 ton mass would have been measurably slowed during that time interval; SEs with doctorates have better sense. Duff is a coward who bans anyone who disagrees with his crap. He pulled down a number of my posts on his “veterans”today dog-and-pony show, and even lied about it when I emailed him. He later admitted it and told me I was blocked, but could not give me a legitimate reason. If you’re dumb enough to believe that this clown has “briefings” with high-level military and government figures, and gains special insight from them to share with readers on the Internet, that’s your problem. He’s nothing more than a liar and profiteering charlatan preying on the gullible. Read NCSTAR 1A and 1-9 if you’d like to know what caused the top ~35 floors of WTC 7 to begin falling. W14 X 730 columns weigh 730# per foot and have 4.9″ flanges, so even your imaginary nanothermite wouldn’t have cut them silently, and we certainly wouldn’t need Barry Jennings to tell us about it. Among other things, Duff couldn’t explain why Larry Silverstein’s 12 insurers all paid him a total of $4.68 billion if he publicly admitted to blowing up WTC 7, so it was easier to toss insults at the questioner and ban him. I’m sure he could pee down your leg and tell you it’s raining, however. Swiss Re, Lloyd’s, Zurich Re, and Copenhagen Re were some of the criminal enterprises who paid Larry Silverstein the $4.68 billion, roggie, which covered about 1/3 of his 9/11 losses. In other words, even the 9/11 Commission can’t say the govt was involved. The Bush administration keopt them from reporting that the Bush govt failed to protect us on 9/11. Bush wanted to save face and kept some of the commission member from seeing all the evidence until later. That is what I see. Nothing more or less. Cut/paste master. I guess it beats having to think on your own. The practise was to label CTists as CTists. Who else would be so gullible to think that all those “coincidences, half truths, guesses, non-expert opinions, assumptions, 2nd hand info, and flat out lies” add up to a govt inside job? Just 1% of the world. When you add in those that has higher than a HS dipoma/GED, the number falls quickly to <.3%. If you add experts in the respective fields,, the number falls to <.045%. Those are not good odds. That means for the architectural and engineering fields just in the US, only 99.95% believe in the CAE (Commonly Accepted Events). Now what percentage of those in the CTists range do not believe their version, yet are playing along to keep the paychecks coming in? You need to re-learn your cliches. This is funny when you stop cutting and pasting, you sound like a 3rd grader. Stories they made up. How fitting. Cut and paste. Repeat. cut and Paste. Repeat. Hybrid, Boomer, You guys are in over your head here. We never bought any of your funny stories, your canned cut/pastes, and childish rhetoric about how the govt really cares about two little misfits. “You have no choice now, wake up or die a slave”??? Since I make quite a bit of money, you are the slave and yo are forced to invent the spooky govt stories so that you fell like you are saving yourself. But petty paranoia is just the symptom of most CTists and they can’t leave the house unless they are wearing their tinfoil under their beenie. When you say “The fact is…” unless you have an expertise in that field, you would be guessing/lying. Which is it? So, do you think that the excessive damage caused by either aircraft and fire, or extensive damage from a falling skyscraper and fire would have anything to do with “dismemberment”? In order for your theory to hold true, you would need to either limite the damage cuased by eigher of these or pretend they didn’t happen. Which will it be? Why do CTists sound like 3rd when they get off topic and need to pretend they are more informed and educated when ifn fact, they are just parroting the words of those that are leading them around. Look at hybrid when she thinks she can predict the collapse rate of a skyscraper, the impact analysis of an arliner into a concrete building, the military application of alert aircraft, and CIA operations all based on the reading of a short list of CT websites and ZERO education, experience, or training. So, Hybrid, what level of education have you acheived? It seems you forgot to tell us all. Boomer? Did you graduate HS yet? GED in progress is acceptable as well. Remember, if you cannot refute a claim, pretend those that prove your point impossible are just a aprt of the CT. If we prove the FF prove the building didn’t have explsives, then say the FF are part of the CT. If the insurance companies disprove your point, then blame them for being in on it. Yes, the list of those that would need to be implicit grows each time you prove a CTist wrong. “I am noticing an uptick of government shills on all the forums I have been reading lately.” Yes, the govt is coming after you. Just you. The govt has nothing better to do than to go onto CT message boards and expose how uneducated you are. Looks like the paranoia is coming out again. Remember, shiny side up. YES!! Robert DeNiro is part of the CT now!! How it must feel to the the bottom 1% of society. CAE is surrounding you and you can’t do a thing about it. Try calling names, it helps with the other 3rd graders deal with being an outcast. Do you cut/paste these things on every messge board? I can Google Judas and CT and your name pops up too many times? Then what do you do with the money your mommy gives you? Yes going down the tubes as the COTO crew turn out to be 3 lost souls pretending they matter. Oh the irony of how this links paranoia, schitzophrenia, dillusional fantasies, and out right bi-polar disorders. We get so much enjoyment each time you post. I can see why you shy away from on-topic subjects because CTists need to spend most of their time pretending they are superior to those that have true experience, education, and training. So it’s your understanding that insurance companies just pay out billions to guys in the US who publicly admit to blowing up their own property, roggie, even companies in London, Zurich, and Copenhagen, but they contest claims for double the policy amounts based on 2 plane crashes? Nope, there is a group of us. It is up to 8 now. Another engineer wanted in. I am posting all your claims on a group bioard and we get a good laugh at yo canned responses and non-answers. We can always tell when we get close to a hot spot. You turn it around quickly and change the subject. We are keeping track of how you respond because we are trying to match it up to others we are doing this to. You are falling right in line with the bottom 25th percentile. Your answers are too canned to think you understand the topic. You repeat stuff that should have been corrected instantly. City camo/urban camo was the best. Anybody that has a shred of understanding knows that jungle, desert (not desertation), woodland, urban, and of course, digital camo are the common ones. Any of these were acceptable answers. But since you were “self-taught”, you would never know where to look for the answers. Webster Tarpley’s bank account thanks you generously. After all, his science fiction bopoks are a great source of income for him. His cases are hardly air tight as if they were, he would have had a Grand Jury by now. He has nothing but a few gullible people to buy his books and pretend they are factual. To prove this, tell us his greatest claim that is “air tight”. Let’s see if you really can express what you read. You can re-read it if necessary as your congitive thought is not really up to mark. Oh that’s right, you were the one crying about spelling earlier. I guess hypocrisy is just another asset you can add to your limited resume. Nice way of getting out of answering the question. We will have to add this to your tally. Canned, nonsensical ramblings. blah, blah, blah, cognitive dissonance , blah, blah, blah. Still no answers, jsut childish dodging. Why didn’t the Air Defenses at the Pentagon shoot down the missile? 1 hit of the button and blam, they could have been heroes and defended the US against attack. Orders to do what, roggie? AA 77 wasn’t shot down because none of the 4 armed and airborne fighters in the NORAD system had engaged it, roggie. The 2 from Otis were establishing CAP over NYC, and the 2 from Langley were directed to NYC to support them. Your yarn about “asbestos problems” in the WTC is pure nonsense. Its use was discontinued after the first 38 floors of the North Tower, and was a non-issue in the South Tower and WTC 7. Your “memory” does not serve you correctly, and abatement, not permanent filters, is the usual method of dealing with it. That had already been done in the 38 floors of the NT during various tenant fit-outs prior to 2001. Silverstein was not the only bidder when the PA offered the leases, nor were they the highest. Vornado Realty Trust outbid them, but backed out of negotiations because of monetary demands having nothing to do with your imaginary asbestos. Those are quite the qualifications. Is that that is needed to be taken as an expert? When Walter said roriguez saved hundreds, I knew had no clue about the facts of 9/11. Everything given past that was a joke and a poorly researched guess. I searched the plans and documents for the building of the towers and ot a single mention of a planned collapse. Why would Walter make this up? There’s nothing “imaginary” about the code changes that prohibited asbestos use in building construction and renovation before the South Tower was closed in, roggie, and long before WTC 7 was even started. It was only used in the bottom 38 floors of the North Tower, but that had mostly been removed prior to 2001. Your “micro fiber filtration system” (HEPA?) yarn is entirely imaginary, however. Are you saying that asbestos is still legal in building construction, roggie? Do we now control it by putting super-duper filters into the air ducts? Where in the US can I buy some SFRM or thermal insulation with asbestos in it? “And then along comes Larry” and his extensive controlled demotion industry experience. Afterall, who would know about the super secret term “Pull it”??? “Pull It” means to demolish a buildign with thermite and make sure it falls down in the same direction as gravity. Otherwise, pulling it, would infer you were actually attaching cables and pulling it. Don’t tell the others, they will just get confused. Why do you think it’s funny to lie about stuff, roggie? So you’re not lying about the alleged “asbestos problem” at the WTC, roggie? Does any of that bother you at all? So you don’t care that there was no “asbestos problem,” and that Water Boy lied about what Silverstein said? “They” does not mean “The fire department commander AND I”; it means the FDNY, so are you accusing them of blowing up WTC 7? Silverstein always talks in the 3rd person. So when he said “they” he meant “we” and when he said “me”, he meant “them”. This is how assumptions work in CTs. In order for this talking point to work, they need him to admit he called for the demolition. The fact that he was concerned for the FF lives, doesn’t seem to matter to CTists. THE FDNY MADE THE DECISION, so why are you accusing Silverstein? Keep in mind that for this canned talking point to be necessary in the 9/11 CT, the term “Pull It” must have meant something related to the building collapse. Look how the CTists fill in that assumption. They invent a claim that “Pull It” is an industry term to mean that it is the order to bring down a building with explosives via a controlled demolition (CD). If you were to look at the origins of this talkng point, CTists first pretended to know this was used through out the industry even when every single expert had never heard of it before. Even a call to the secretary of the President of CDI was tried to nake her claim it was true when her experience with CD’s was helping the President with scehduling the clients of the company. I guess if you cannot find an expert, anybody will do. Yes, he said “Pull”. There you have it. “Pull” means to wire a burning building with high explosives? Or just attach cables to the sides and “pull” it down? Maybe there are CTists here that would know more about the term? What do you call someone who deliberately substitutes words in someone else’s statement, solely to alter the meaning of it, and then libels that person with something that he didn’t say? Why do you have such a fondness for liars, roggie? It is funny to see links posted and hybrid then changes the subject. A celebrated and popular church leader called his leadership members to explain the policiy of the church and how it will handle heresy. If anyone disagrees with the churches teachings, he will be deemed a liar and a fraud. A quiet man tells a group of people that he has been able to prove that the sun is the center of the solar system and it is the Earth that orbits around the sun and not the other way around. The moral of the story, if you have scientific facts and there are people that want to use their eyes instead of science, you will never be able to teach them. When 80% of the posts are hybrid’s meltdowns, what can you conclude? Why would the Pentagon have missiles set to launch automatically at airliners with no IFF “friendly” signal right next to Reagan National Airport, roggie? Do you really think airliners can’t fly near it, when hundreds of them land every day <1 mile away from it? Why do you like liars so much? It is excruciatingly stupid to believe that the Pentagon shoots down airliners just for flying close to it, roggie, when Reagan National Airport’s a mile away. It’s also pretty stupid to believe any of Grifter’s other crap. My URL isn’t stupid; it’s factual, so read it and learn something. It’s too bad that the UN and NATO prevented a massacre at Misrata and stopped Ghadafy’s righteous minions from slaughtering thousands more throughout Libya, roggie, but I’m sure you’ll get over it. How their limited intervention in a civil war equates to US imperialism has somehow eluded me, but I considered the source and it made much more sense. The evil US now takes over whole countries without sending in any troops, and Obama’s secretly in the PNAC. I responded to your Israel/Mossad nonsense, roggie. You changed the topic to Libya. I think you’re an authority on never wising up, roggie, so I’ll defer to you on that one. I’ve already explained that there’s no evidence of a connection between the Mossad and al Qaeda’s suicide attacks on 9/11, roggie. Does somebody need to explain what “evidence ” means? A, B, C, um…uh…Proves Z. See OVERWHELMING evidence. Anybody that refuses to see it must hate the facts. Let’s see hybrid’s great “evidence”. I bet we can pick every single evidentiary exclusion in his claims. Hybrid doesn’t understand it, must mean it can’t happen. I bet Galileo would have hated you. Yep. You showed us….well…..a claim that it was proven. You proved to us that….um….uh….It was explained. You demonstrated that…..ahh…….well……facts were presented. In reality, you have done nothing. You rant, cry,a nd pretend to know the topic. You give us childishnesss that rivals most CTists. You state that the debate is over, yet you keep trying to spout a response. You hve given us 100s of paragraphs of writings, yet say nothing. What exactly are you afraid of? 99% of CTists think that my questions are inconvenient. They get upset because they are too tough. I give everyone the same opportunity to explain their opinion, yet a cast majority resort to the typical defense mechanism that plagues the so-called “truth” movement. So, give us your best CT website to show us that there was any evidence presented. Maybe you can “hope” that by asking direct questions to your beliefs, it would be a “vile propaganda technique”. but, if I cannot identify which of the 1000s of versions you ascribe to, how will ever truly undestand what it takes to be considered a “truther”? “You are ID’d as a collaborating stooge for the system.”?? The system? What “system”? Is this your poor attempt at labeling a vague and mysterious faction of people that oversea the world? “Your mission has failed dramatically.”??? Mission? What “mission”? I want to expose your lack of basic education, knowledge, and experience as the root of pretending that there is a evil “system” out there to scare little kids as yourself. You cannot even present ANY evidence of the involvement of Jews. Why? Is your bigotry now passing? I guess that canned talking point ran itself into the ground as fruitless. Much like thermite and space beams. Maybe you can just give a “youtube” video to prevent you from having to use original thought. We ALL know that CTists are world reknown for this.